I am sure that like me you were shocked and horrified to watch the news last night coming out of the embattled cities of Mosul and Alleppo. The scenes we witnessed will undoubtedly result in an increase in the numbers of people seeking refuge in the refugee camps in the area. You may have felt powerless to do anything meaningful to help these people not only get through this winter but rebuild their lives and their communities. 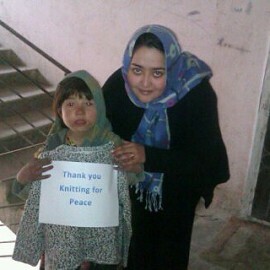 Knit for Peace has been sending regular shipments of donated knitted and crocheted warm clothes and blankets to the millions of Syrian and Iraqui refugees in camps near Erbil for over a year now. We think we can do more. Thanks to a generous donation of wool from Love Knitting magazine we are shipping wool, needles and other knitting equipment to the camp at Darashakran (near Erbil) where local charity Zihn have set up sewing groups. These donations will enable women (and older children) to begin to make things not just for themselves and their families but also potentially for sale. Knitting and crochet are already crafts practiced within these communities and have well evidenced health and wellbeing benefits – particularly for mental health. It will also give women an opportunity to come together within their new community. In the future, when they are hopefully able to return to their war ravaged homes, they will be able to continue with this new enterprise and begin to rebuild their lives. Knit for Peace has set up groups in the past bringing Hutu and Tutsi war widows together in Rwanda, Muslims and Hindus together in India and groups in Pakistan, Bangladesh, Nepal and Afghanistan. 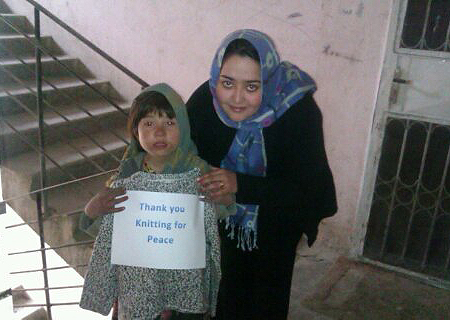 We know that Knitting for Peace works! The thing we need most at the moment is funds to ship the wool and equipment. Our target is to raise £25k before Christmas – that’s a thousand pounds a day. Donations can be made via our My Donate page here: https://mydonate.bt.com/events/kfprefugee/383690? If we exceed this target we will be able to send more wool, knitted and crocheted items throughout the winter. We are also still accepting donations of knitting and crocheted items but like the wool we also need funds to help get these to the camps. Items can be sent to the address above, please mark the package ‘Refugee Appeal’. Please help us by supporting and publicising this appeal.